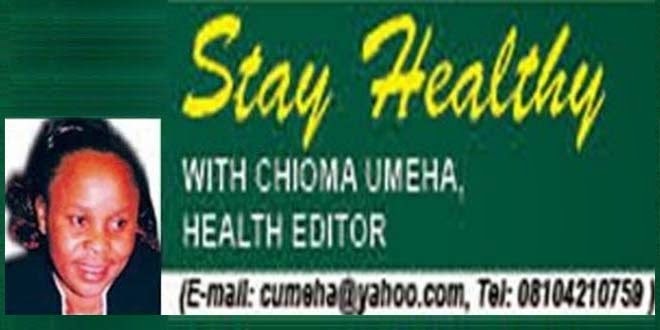 While some health watchers are busy celebrating the expected malaria vaccine that will prevent millions of young children from catching the disease, some experts have raised doubts over the ability of Nigeria to provide required funding to rid the vector. The new vaccine would be available in October after trial results found that it reduces number of cases by half. But, experts have said that Nigeria’s programme on malaria may be far from achieving the desired result of eliminating malaria unless there is further cheering news about the trial vaccines currently going on in seven African countries. Although the promising trial vaccine which has been tested on 16,000 children from seven African countries excluding Nigeria found that booster doses were of limited use and vaccines in young babies were not effective, experts have warned that unless more funding is made available, Nigeria may never be rid of the malaria vector. Scientists gathering at the Nigerian Institute of Medical Research (NIMR), Lagos on Tuesday, at a symposium to mark the World Malaria Day submitted that the various efforts at combating the endemic disease in the country “have been complex and contradictory, hence near futility”. 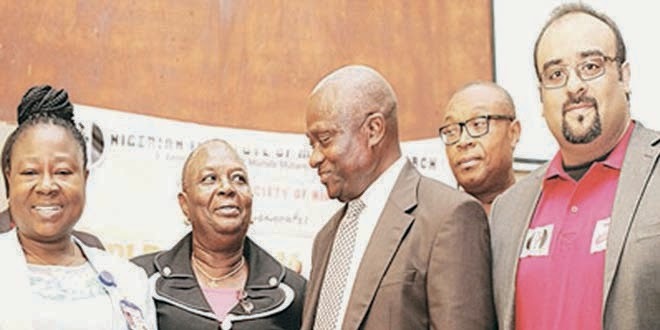 Representative of Director General, Nigerian Institute of Medical Research (NIMR), Dr. Odunukwe Nkiruka (left); Chairman of the occasion, Prof. Olubunmi Otubanjo; Lagos State Commissioner for Health, Dr. Jide Idris; and Category Manager, Pest Care, Health Care, and Air Care, RB West Africa, Qaiser Rashid, during a symposium in commemoration of World Malaria Day 2015 in Lagos, Tuesday. Addressing the audience, Director General, Professor Innocent Ujah, represented by Director of Research, Nkiruka Odunukwe, noted; “Although the 2014 World malaria reports testifies to the fact that the malaria target under the MDG 6 had been met with 55 countries on track to reduce the malaria burden by 75 per cent by the end of 2015, the situation in Nigeria is complex and contradictory. “Whereas, malaria had accounted for over 60 per cent of hospital out-patient visits, 25 per cent infant deaths, 30 per cent of all under-five and 11 per cent of maternal mortality annually, all the efforts to improve on these figures through the National Malaria Elimination Programme has not significantly changed the trend”, observed the DG. Ujah lamented that the economic loss to the Nigerian nation as a result of man-hour loss per annum from absenteeism from work due to malaria fever is enormous and runs into billions of Naira. In his keynote address on the theme: ‘Invest in the future, Defeat Malaria’, Lagos State commissioner for health, Dr Jide Idris observed that though NIMR has been involved in a lot of research works on malaria, the effect would only be meaningful if sufficient support is given for scaling up of findings by all stakeholders with federal government taking the lead. According to Idris, “A lot of the research funding for NIMR comes from external bodies; there is need for concerted effort to invest more seriously in our public health institutions especially in the area of research”. The Commissioner stated that no country can make any progress especially in the health sector without research because that is the only place where new things are discovered and new things are modified. “Findings are made and these help in making decisions and guidelines for policies which are very essential”, said Idris. The Lagos Ministry of Health boss challenged the in-coming administration of the General Muhammadu Buhari to revisit some of the moribund health facilities and revitalize same. According to Idris, there is very strong awareness now in the country and we know there is need to address our decaying infrastructure, the moribund vaccine factory is definitely part of the infrastructure which has to be refurbished and staffed and equipped so that we can encourage our scientists. Dr Samson Awolowo, Head of Malaria Research Group of the Institute attributed the high rate of death due to malaria to the widespread of fake medicines and parasite resistance to malaria drugs. Awolola said that mosquitoes resistance to insecticides and lack of fund for malaria research also contributed to the high cases of the ailment in Nigeria. “We need more funding into malaria research if we want to totally address these challenges and reduce deaths due to malaria,” he added. Also speaking, Prof. Olubunmi Otubanjo, a Professor of Parasitology at the University of Ibadan said that malaria prevention and control should not be left out in the era of change as Nigeria begins a new dispensation. Otubanjo said that Nigeria contributed to one-quarter of all malaria cases in Africa and the incoming government should place high priority on prevention and control of the malaria. “Malaria should not be left out in this era of change with more funding to healthcare, effective partnership, and sustained political will to ensure a malaria-free nation, “ she said. Dr Tolu Arowolo, a representative of the World Health Organisation (WHO) said there was the need to generate public awareness about the dangers of poor quality malaria drugs. Arowolo said that education campaigns would also help the public make more informed choices about preventive measures like insecticide-treated bed nets and residual indoor spraying. The President, Malaria Society of Nigeria, Dr John Puddicombe, said controlling and preventing malaria required a collaborative effort from all sectors of the society. He said that everyone could help a great deal in advocacy, social mobilisation campaigns as no single person or unit could do it alone. “Just as the government at all levels has the responsibility to strengthen the health system, individually and as a group, the citizens also have a big stake. “We have the responsibility of protecting ourselves and our children from malaria by using insecticide-treated nets, draining of stagnant water and keeping our environment clean,” he said. Meanwhile, the Niger Government has said that the state is losing more than N5.2 billion on the prevention, control, treatment cost and loss of man hours. The state Commissioner for Health and Hospital Services, Hajiya Hadiza Abdullahi, disclosed during this year’s World Malaria Day in Minna. Abdullahi said that this informed government priority to fight the scourge among the infants and adults in the state. “Historically, Niger state has remained the leading state in the central zone of the country in malaria elimination programme. “In the last three years, the state has maintained its position within the top three states in the country,” she said. Abdullahi, represented by the ministry’s Permanent Secretary, Dr Ibrahim Tifi, added that malaria accounts for 30 per cent of under-five year’s mortality and 11 per cent maternal deaths. Similarly, the Support to National Malaria Programme (SUNMAP) revealed that it covered 95 per cent of the state in distribution of Long Lasting Insecticidal Nets (LLIN) last year. Dr Olatunde Olotu, SUNMAP Niger Technical Malaria Manager, said that the residents have embraced the LLIN. “Over the years, we have ensured the vast embracing of treated mosquito nets across the state. “So, whatever intervention will come in malaria control, the net serves as first point of referral,” he said. The event was attended by top government functionaries and development partners from WHO and UNICEF.